Hello There, VivBounty here to share with you a new discipline, Tai Chi, which is already having really positive effects on my mobility and general well being. Much to our good fortune, the Province of New Brunswick has provided a grant through the Wellness Branch of the Department to the Port Elgin and Region Health Centre (PERHC) for an introduction to Tai Chi. Thank you to Instructor Rick Toupin from the Cumberland group Canadian Tai Chi Academy for providing a complimentary, 12-week introduction to the health benefits of Tai Chi. I was so excited to have a Tai Chi class locally, and by that I mean really locally, not having to drive to Amherst or Sackville, our nearest towns for most services, I called all my friends who might be interested and happily posted it in the church bulletin! The class has been full and then some in our little school gym, where you last saw my Remembrance Day post. We started a week later than planned, on Monday February 15, 2016 due to a snow storm (hardly surprising for February in the Canadian Maritimes and will run 12 weeks, excluding March Break and Easter Monday) at 7:30 pm on Mondays. After our first Tai Chi class, I noticed increase soreness in my trouble spots, ie shoulders and neck, but let me tell you that through that discomfort in the 24 hours following that first hour-long class, I felt something unlock. The result of which was being able to actually sleep on a pillow for the first time in 2 or 3 years! We heard testimony that first class that one of the volunteers who came with the instructors to help demonstrate, had a frozen shoulder, had been through physiotherapy without any success, was able to unlock her shoulder and regain range of motion after just 6 months of practicing Tai Chi. In the video below, see how deceptively gentle this exercise is as Rod and Rick give a review of the first 3 moves we learned in our first class. These moves are called 1. Opening move raising hands, 2. Left grab bird's tail and 3. Right grab bird's tail. NOTE - UPDATE: Today, March 9th, 2017, after more than a year! I have been told to take the YouTube video of our Tai Chi class down. It seems that one of the instructors, after giving me permission to record it and put it on my blog, now says he told not to put it on YouTube which is just a blatant lie. So I will not apologize for you not seeing the video because this is his fault. Tai Chi can lower your blood pressure, reduce or even remove pain from arthritis, reduce the risk of alzheimers, improve strength and balance. 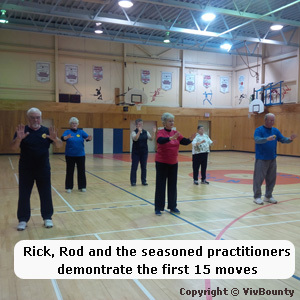 Moy Tai Chi has 108 moves developed for health and brought to Canada by Mister Moy Lin- Shinn. This is a perfect compliment to my twice daily yoga and daily reiki practice. As I said, I am already experiencing for myself the many health benefits offered by this gentle aerobic exercise imported from the far east, and being very open to it as reiki also came to the west from Japan. I know what gentle movement or energy shifting can do and highly recommend anyone try Tai Chi. Rick from the Canadian Tai Chi Academy, is a great instructor who put us through the paces with humour and gentle encouragement. In our second class, through much giggling and fun, we added a 4th move called whip out dead bird hold by tail. Thank you class participants for allowing me to record this video below. NOTE UPDATE: Over a year later, suddenly I have been told to take the video down! Again, this instructor with a memory problem is the reason there is no video below. I wish people would say what they mean and mean what they say! Blaming me for his lapse in memory is just plain wrong! With Rick and the other seasoned practitioners' permission, I was able to take some video and a few photos of our second class. By this time the soreness had disappeared from my neck and shoulders and as I was explaining to Brenda, yes I felt pain, but that only indicated to me that the Tai Chi was working. Continuing through the discomfort with my twice daily yoga practice, I have regained range of motion in my shoulder and sleep so much better. As she said and I agreed, "If you do nothing, it only gets worse and you're stuck there." The video below is what we aspire to. All of the wonderful folks who teach and practice at the Canadian Tai Chi Academy in Cumberland county, Nova Scotia, kindly gave us this demonstration of the first 15 moves. 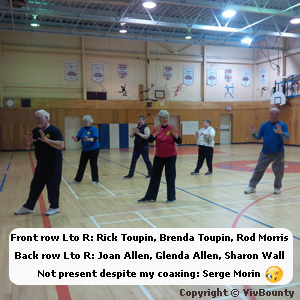 The hushed voice you hear is that of Serge Morin explaining that there are a total of 108 Tai Chi moves and to do them all in practice takes 15 minutes. I can certainly find 15 minutes in my day to improve my health. Can you? NO VIDEO HERE EITHER! Told to take it down over a year later! Shame on him. The only people to benefit from this video is them getting free publicity. Sad. You can't take care of anyone if you don't take care of yourself first, so do that then hug everyone you love because tomorrow is not promised. Welcome to VivBounty Wonderful Country Living blog where we talk about lovely discoveries about the joy of country living to inspire and hope to share knowledge with you. While products advertised here are simply those we like and have found useful, VivBounty is an Affiliate Marketing Company marketing our own products, services, memberships, newsletters and article sites. In addition we discuss and market similar products from third party contributors like natural pet products, which we like and have found effective for profit. We also display Google Adsense advertising as well as ads for products from Amazon.com, Clickbank, Lead Generating Tools and other companies we are affiliated with across our blogs and Web sites as an avenue of revenue-sharing.